Another February has rolled around and we are readying the farm for another season. 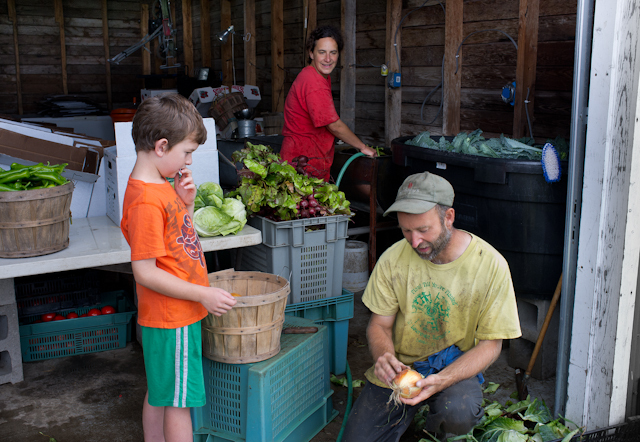 NOW is the time to sign up for the summer CSA season. We are doing something new and exciting this year by offering ‘farmstand bucks’ with a membership for use at our on-site farm stand or to arrange for bulk purchases (available for pick-up on farm). Our idea is to give member more flexibility with their membership. In each 3/4 bushel box you will receive a mix of what is in season (between 8-12 different crops each week). The early season boxes will be quite a bit different than late season boxes. 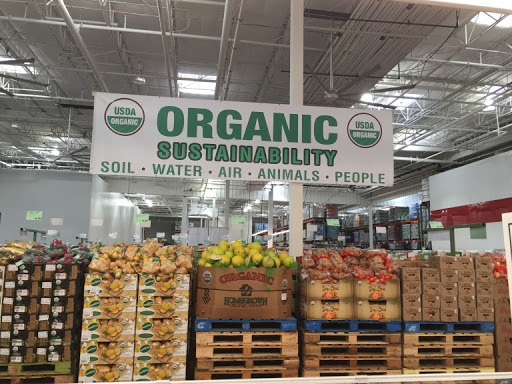 We are a certified organic operation, so all our crops are grown without any synthetic pesticide, herbicide, or fertilizer. We concentrate on the staples like lettuce, tomatoes, and sweet corn, but we also mix it up with some interesting crops too. Please fill our our 2018 order form below to join for the year. We ask for half the payment when you sign up with the remainder due half way through the summer. We do fill up each year, so please contact either Maree or Ryan to confirm availablity if you’re reading this after April 1 or reach out with any other question you may have. Find us at lidafarmer@gmail.com or 218-342-2619. We’ll make a note on this website and on Facebook when we do fill up. The world we live in today has what I call hyper-surplus. Lots of shopping happens in large big box stores with products piled 30-feet high or online where the likes of Amazon has virtually unlimited supply of anything. It’s been well discussed that, in this environment, we’ve all been trained to get whatever we want whenever we want it – myself included. Over the years I’ve found that these expectations have bled into my own little business as well. I’ve gotten more incredulous reactions from people at the farmers market or on the phone when I tell people, “Sorry, I can’t supply 50 lbs of beets…or, 5 bushels of tomatoes…or, 30 lbs of salad mix with a day’s notice.” It isn’t that I’m keeping the good stuff all stored away in a warehouse and just choosing not to sell; that would be foolish. Indeed, if I had a warehouse of produce, you’re darn right I’d sell any product at any quantity possible. But, this is where farming and wholesaling diverge – farming in general and Lida Farm in particular have very real limits. One, farming takes time. Two, land has limits of production, no matter how much agro-chemical companies try to tell us otherwise. Time: If a store run out of a product, it’s simply time to re-order. If we run out of a vegetable, it’s impossible to manufacture on the spot. I made the decision about how many celery plants to grow 80 days before harvest and there’s no going back in time to fix it. The other time constraint is simply what it takes to harvest and prepare a vegetable. Today’s salad mix, for example, took about two hours to harvest, wash, and bag – and this is just one of 12 crops in the box. Combine with juggling a farmers market and three farm stands, and it’s a wonder we’ve been getting these boxes out mostly on time at all. Land: We grow produce on the four acres of tillage land which would actually work for vegetables on our 20-acre farm. We can certainly always do a better job of weeding and managing crops, but, let me assure you that no matter how well managed, an acre of produce can only produce so much stuff. Even with a very successful potato crop this year, we have at best 1,200 lbs left. Once they are gone, they are over until 2018. Even if we did a perfect job weeding, cultivating, and managing the crop, we might have 200 lbs more. Although these limits keep us from a few more sales, that’s fine. I remind myself that we can only grow as fast as soil builds, which is quite a bit slower than our modern world generates pixels or robots manufacture goods. I also remind myself that I’m a human organism, which also has limits of time and energy, even a season not unlike plants. We should all remember that in this 24/7 world, our limits are not something to bemoan, but accept and celebrate because they make us humans, not machines. Delicata Squash: Yellow-striped sqaush. Good baked in oven dry. Acorn Squash: Great for stuffing. Try doing a stuff with breadcrumbs, the sage in the box, and bulk pork sausage. Poblano Peppers: Yes, these have some heat, but not much. “Hand me that pipe wrench…you have to turn that really tight for it to hold…thinking about where the world’s heading, I really want you to go to school so you can work with your mind and not your hands…” I received many lessons about life and talked about important things in our lives while working a jobsite with my dad. Since then, the men I’ve connected with the most has been through work. And I mean real work-not the two of us looking at an Excel sheet together-but physically laboring together. The act of work alone brought us together, and time working together was also the opportunity when we talked about things that matter: death and love, fatherhood, community responsibilities. I’ve had similar experiences with women in my life, certainly, but I bring this up in the context of men in large part because men have been in a funk lately. Men are all worked up about their identity and their role in today’s age…the path just isn’t as clear as past generations. This causes a whole host of issues as men shirk their ‘traditional’ responsibilities as fathers and husbands and engagement with neighbors. Maybe it’s just my blue collar upbringing, but I imagine we’re in this funk because we’ve lost those work settings where we mentored young men and connected with each other. Since the beginning of civilation we’ve labored together side-by-side in this fashion and now we remotely play Playstation or watch ESPN together. In my view agriculture has and can still play this all-important role of bringing us together for real connection and giving us purpose. Instead of bemoaning the loss of farming as we often do, let’s do some fencing already! Invite over some friends, get some nails, and build and create. Chase some calves together through a pasture. I think men and the world will be better for it – at the very least women will enjoy getting them out of the house for awhile. Garlic scapes (see recipe below): Small bunch of green curley things with a rubber band. You can also check out this link if you’re confused about how to use them. Napa cabbage: This is the second week, so I hope I didn’t wear out my welcome on this one. Puree in blender or food processor. use as a dip for veggies, crackers, or chips.